Netflix has released the first trailer for The Package. That title may sound innocent and inconspicuous enough, that is, until you realize what's really going on here. For better or for worse, this lowbrow teen comedy may well end up being one of the most talked about releases of the year. Simply put, this movie centers around a teenage boy who winds up literally cutting off his manhood in the woods. Yes, there's a lot more going on but that's very clearly the hook. This, based on the first Netflix trailer, starts out as your standard, direct-to-DVD type of teen comedy, sort of like several of those American Pie sequels that nobody ever bothered to watch. A group of five young people head deep into the woods so that they can drink, do drugs and not be bothered by the adults who simply wouldn't approve of such behavior. Usually, something goes wrong in these comedies but here, they really take it to the next level. While the trailer does an okay job of trying to hide this movie's secret, it's painfully clear that the gimmick here involves one of the unlucky kids cutting off his, to steal a phrase from Juno, pork sword. The synopsis for The Package reads, "When five teens go on a spring break camping trip, an unfortunate accident sets off a race against time to save their friend's most prized possession." Referring to the item in question as his most prized possession is certainly one way around saying exactly what it is that's going on here. 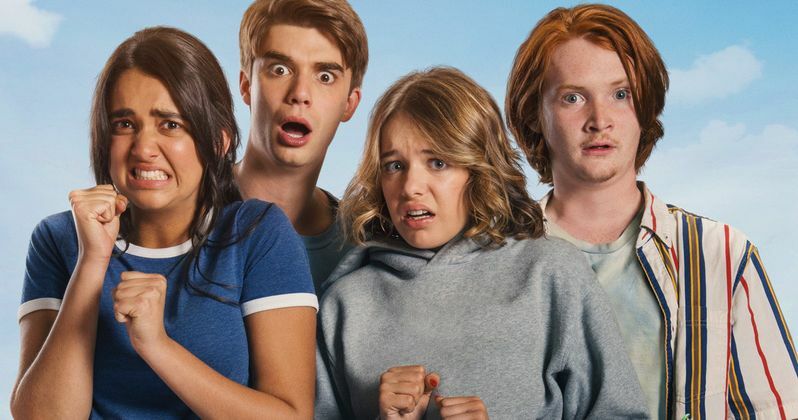 The cast includes Daniel Doheny, Geraldine Viswanathan, Sadie Calvano, Luke Spencer Roberts, Eduardo Franco, Michael Eklund, Gary Jones, Alexander Calvert, Sugar Lyn Beard and Blake Anderson. Viswanathan already turned in a memorable performance earlier this year in Blockers, which is easily one of the best comedies of 2018 so far. She's cooking up a memorable year for herself, that's for sure. As the trailer boasts, this comes from the folks behind Workaholics and Tropic Thunder. It's produced by Nicholas Weinstock, Adam Devine, Anders Holm, Blake Anderson, Kyle Newacheck and Ross M. Dinerstein. Jake Szymanski, who previously helmed Mike and Dave Need Wedding Dates, is the man in the director's chair. The script comes from Kevin Burrows and Matt Mider. This marks their feature writing debut. This is one way to make a splashy entrance. Save for the big incident that takes place, The Package trailer also includes plenty of fart jokes, physical comedy and things of that sort. There's no telling how this is going to turn out, but it's amazing that Netflix streaming is set to release The Package on August 10. Be sure to check out the first trailer for yourself below.